Sometimes you think you’ll know what a book will be about and it ends up being completely different. 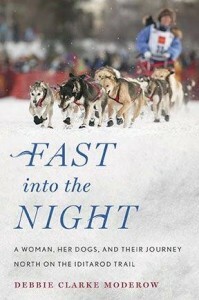 I knew Debbie Clarke Moderow’s latest work, Fast Into The Night: A Woman, Her Dogs, and Her Journey North on the Iditarod Trail, would be about a race in Alaska. I didn’t know I’d take away lessons in determination and fall in love with dogs who are not my own. You don’t need to be a dog lover, an Iditarod expert, or even an adventurer to fall in love with Fast Into The Night. But if you’re looking for a non-fiction piece to motivate you and touch your heart, Debbie’s book needs to be your next pick. Portlanders can meet Debbie Clarke Moderow at Powell’s on Burnside Wednesday, February 17 at 7:30. Non-locals can buy the book here. Get ready for the ride of a lifetime.